Even though nowadays highly commercialized, Christmas is still a very nice Holiday and I like it very much. I enjoy choosing good presents for my family and friends, usually things that I know they will appreciate and actually use, to wrap them up in colorful paper (I am terrible at this though!) and also, of course, receive presents as well. We don't have Christmas decorations at home, except one candle that we light in the evening, so I had the idea to create a Christmas Bento! 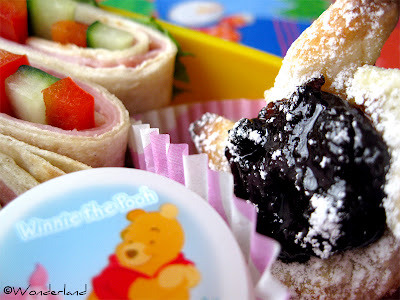 To make a Christmas themed bento without the proper cutters and decorations (you know, gingerbread, tree, reindeer shaped) is quite challenging... But I made it anyway! 3) Santa was behind the camera, he's a bento freak! 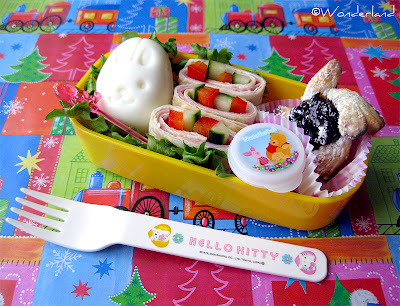 So, the bento contains salad, bunny shaped hard boiled egg (I know, it is more an Easter thing...), tortilla wraps filled with ham, belle pepper & cucumber sticks, Winnie the Pooh sauce container with some chili sauce and a mini Finnish Christmas Tart (you can find the recipe here: link).